When we start talking about healthy recipes or healthy foods, people will always relate them to bland food. It's actually not, because we have choices. Fruits and vegetables can actually be dishes itself. 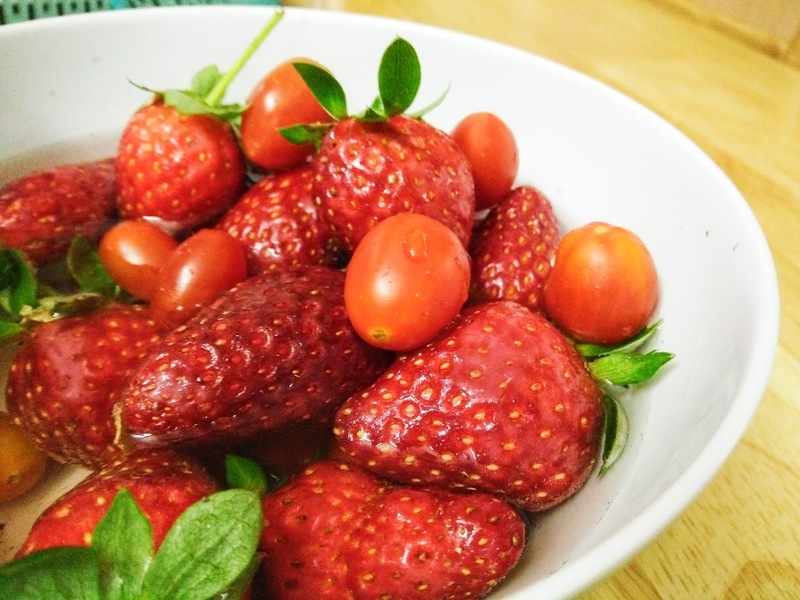 Yet, with the right salad dressing, a colourful bowl of fruits and vegetables mixed with other ingredients can become so much nicer, and it's even better when served and enjoy together. The secret is in its sauce. The commonly used sauce is mayonnaise, and now more people are aware of the roasted sesame sauce. In fact, the most delicious and healthiest sauce might be one that you make for yourself from scratch at home. It's really simple to make a low calories healthy salad dressing by yourself. Before looking at the recipe, the question is, why not just use the ready-to-use regular mayo? It shall be started with an understanding of how mayonnaise is made of. It is a stable emulsion of oil, egg yolk, and acid, either vinegar or lemon juice, added with salt and other spices. One tablespoon of mayonnaise has approximately 90-100 calories. The fat content in mayo is comprised of saturated fat, polyunsaturated fat and monounsaturated fat, which is not solely the bad one. The problem is people can easily overconsume mayo and therefore we end up adding a lot of calories to a meal. To make a salad dressing without using oil and egg yolk is possible. Afterall, oil contributes to the calories the most; an egg yolk provides you with approximately 200-230mg, while the recommended daily intake of dietary cholesterol for the average healthy person is about 300 milligrams per day. Substituting them with yogurt, which is higher in protein, it tastes SO GOOD! 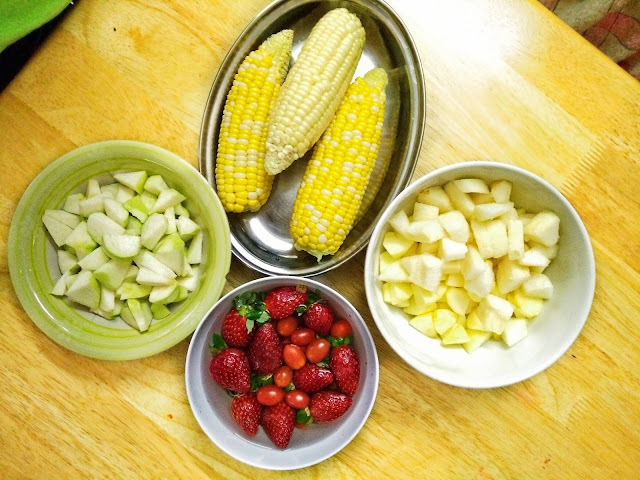 Simply mix all the ingredients together, and next, add it to freshly cut fruits (strawberries, tomatoes, guavas, apples) and corns, or other ingredients based on your preference. 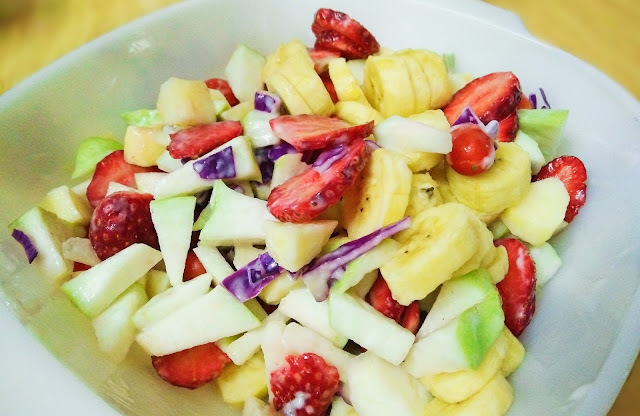 The distinct fresh sour taste from the apple cider vinegar and lime juice, with the slight sweetness from raw honey, together with yogurt which is packed with cultured bacteria "probiotics", this homemade salad dressing is definitely a better option.